GCU London is delighted to announce that the British School of Fashion will be launching two brand new innovative fashion courses which will begin in September 2015. Master’s programmes in Fashion Business Creation and Digital Fashion Strategy will both be introduced to GCU London’s course portfolio later this year. The MSc Fashion Business Creation has been designed in consultation with industry leaders and will ensure the skills taught will be in line with industry needs. The programme is designed to relate directly to real-world fashion business which will prepare students for a career in the fashion industry, whether it’s helping them to launch their own fashion business or giving established businesses the tools to develop and grow. Maggie Smart, Programme Leader, who has 14 years’ experience of creating and operating fashion businesses, said: “The programme will appeal to a variety of people including those who have studied design that are creative, but want the business skills because the harsh fact of our industry is that some go in to business too early and are unprepared. Our programme will prepare students for their future. Maggie also has plans to bring her own business, Macandi Showrooms, on to campus for two six week blocks each academic year. 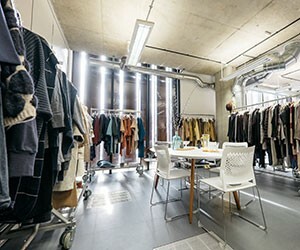 The showroom will provide students with further fashion business experience and give them access to the industry leaders and the ability to learn from the showroom’s experienced sales team. The MSc Digital Fashion Strategy will be the first course of its kind in the world. The programme is unique globally as it focuses on the integration and optimisation of technology specific to needs of the fashion sector. Also developed in consultation with senior industry stakeholders, this innovative course aims to develop graduates to be the digital thought leaders of the future through a distinctive trans-discipline approach to learning and access to the ‘Fashion Lab’. After recently being named Fashion Ambassador Award winners of 2014, these programmes will add further to the British School of Fashion’s ever increasing reputation. Further full information about these programmes will be available soon. Please note that these programmes are subject to validation.